Mangaluru, AUg 18, 2018 : Due to heavy rains and flood and closure of section between Shoranur – Kozhikkode in Palghat Division and Ernakulam – Kottayam – Kayamkulam section in Trivandrum Division, the following changes are made in the pattern of service. Train Traffic between Ernakulam - Kottayam - Kayankulam will be resumed partially from 06.00 hrs on 19 August and special trains will be operated under suitable speed restrictions as required. 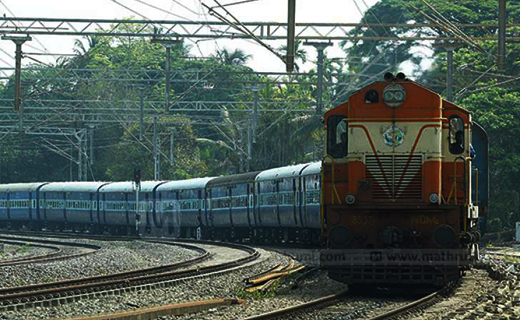 Train Traffic between Ernakulam and Shoranur and Shoranur - Ernakulam will remain suspended upto 16.00 hrs on 19 August. In Palakkad Divsion,train traffic has resumed in Palakkad Junction – Shoranur section today.Also,from Kozhikode, train services are operated up to Tirur. By around 20.00 hrs Shoranur – Kuttipuram stretch also cleared for train traffic and in the night a goods train will be moved first . Now the clearance is waiting for Kuttipuram – Tirur Stretch only. Train No.12659 Nagercoil – Shalimar Express of 19th August will be diverted to run via Tirunelveli, Madurai, Dindigul and Erode.